NANTUCKET - With ocean views from the mahogany deck and a winding path through scrub pines to a sparkling beach, the cottage named "Riding Western" is an island retreat that four years ago easily commanded a $2-million-plus price tag. But like the three-deckers of Medford and the split-level ranches of Framingham, Riding Western is in danger of foreclosure. A bank threatened to sell it at auction and it was rushed onto the market at a cut-rate price, and now the owner is waiting for bank approval on a bid. 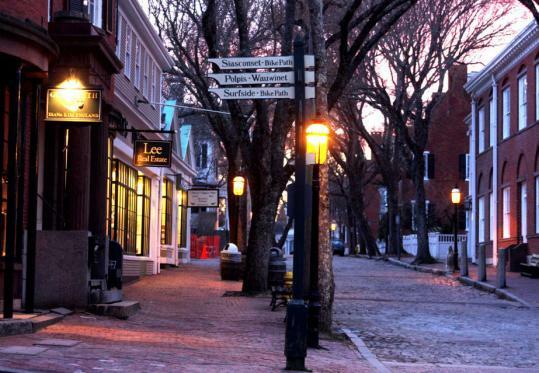 "I thought Nantucket was recession-proof," said Garret Roberts of Rhode Island, the owner. "It definitely is not." Roberts is one of scores of struggling property owners on an island that many assumed was immune to the economic troubles shattering other communities, shielded by the financial wherewithal of its celebrities, financial titans, and well-to-do retiree residents. Since last January, 57 properties on the island have been classified as "distressed," meaning that banks have begun foreclosure proceedings, according to the Warren Group, a Boston-based real estate consulting firm. Home prices have fallen and sales are down. Businesses are struggling; a noted art gallery, the Robert Wilson Gallery, has closed. Town government is taking austerity measures, opting to forgo mosquito control this summer. Even for those so far unscathed, the financial downturn suddenly feels uncomfortably close. "An auction was something we haven't seen," said Elna Soule, who said she lives with her husband, the former president of Paul Revere Insurance, next to a foreclosed property. Traveling the island, signs of the downturn are not obvious. The emblem of the financial crisis - "For Sale" signs flapping on front lawns - are nowhere to be found. "For Sale" signs are not permitted on Nantucket. Houses appear immaculate, even distressed ones, with nary a shingle or shutter out of place. Development at the highest end continues. Workers are busy at the waterfront site of the soon-to-open Great Harbor Yacht Club and the sprawling compound being built by a Canadian mogul on 9 acres overlooking Surfside Beach. Yet, at the tax collector's office, behind closed doors, wealthy residents have explained that they can't come up with thousands of dollars owed in property taxes. The stock market, some said, was to blame. "Some people have cried, some were angry," said Elizabeth Brown, the tax collector. "We've listened and supported them and tried to help them." Brown said her office has accepted partial payments in some cases, with penalties and interest levied and promises of repayment in the future. On Main Street, a $980 upholstered bench sits in a corner of a furniture store - a refugee of the economic upheaval. The bench was ordered by a regular customer of the Stephen Swift furniture store. In the past, the customer had spent thousands of dollars on the store's custom-crafted furniture. But this spring, she called Louise Swift to say that she would not be taking the bench. She said she couldn't abide the cost. "I don't know if her husband had been laid off," Swift said, adding, "He's in finance." The sense of frustration here is acute. The boom transformed this island into one of the wealthiest redoubts in the nation, as hedge fund managers and investment bankers raced from Weston and Greenwich, Conn., to outbid one another for shingled palaces in Pocomo, the Cliff, and Dionis, pushing real estate prices into the stratosphere. Yet in the first quarter of 2009, real estate transactions were down 41 percent compared with the first quarter of 2008; the average home sale price is $2.2 million, a 12 percent decrease from last year, according to the Nantucket Listing Service. Building permits have dropped precipitously, and room occupancy taxes are expected to dip this summer, according town officials. The decreases have left town coffers depleted. C. Elizabeth Gibson, the town manager, said the town considered coming up with a "wish list" - an appeal to the island's wealthiest residents for financial assistance. But the idea died. "There are charitable groups that need the money more," she said. Meanwhile, in a squeaker of a vote, residents at Town Meeting approved the construction of a new police station, but it will be partially outfitted with used furniture, remains from the old station. Sensing a potentially hard summer, businesses such as the Nantucket Gourmet are cutting back inventory. The store is stocking fewer Cuisinarts, jars of Nantucket Secret Spice and Nantucket Pepperguns - the sorts of things that private chefs tend to dash in for before a dinner party. Other businesses are competing in ways they have never had to before. John Merson, who rents renovated historic homes, said he is throwing in a catered dinner and groceries as part of the $5,000 weekly rental price this year. "People are asking for discounts, bargaining hard," he said. "I am trying to use services to compete so I don't have to negotiate price." Amid all of this are the gleeful real estate trollers. In the parlance of brokers, there are "screaming deals" to be had. One example: 3 Pochick Ave., a five-bedroom, five-bath house with a cabana set in a field of lovegrass that recently sold, according to town records, for $3.74 million. The previous owner paid $4.35 million two years earlier. "Buyers know there is distress out there and are taking advantage of that," said realtor Jeanne Hicks. There is some solace, some say, in a story circulating around the island. A man has been calling brokers saying he will offer $750,000 for properties with significantly higher prices. "So far, he's bought nothing," said Jane Miller, another realtor. But he may soon have more options. Beverly Jackson of New York, a retired senior vice president of a media company, said she is struggling to fill her house with renters this summer. Jackson said a less-than-full rental roster will not break her. But she said the difficulty was propelling a reconsideration. "I was planning to sell the house in a couple years," she said. "But now I might put it on the market in a year."